The Children's Academy of The Collective Heart School Project, in association with “Just Like My Child,” is committed to building schools and equipping them with whatever tools they need to successfully educate today’s young Ugandans and Kenyans. To date, we have built 5 schools and are currently developing many other projects - with everything required from walls to books and teachers. Won’t you open your heart to help us? PLUS! Through The Collective Heart's “Project Universal Education” thousands of children will attend clean, bright, and safe schools that they previously would never have been able to access. 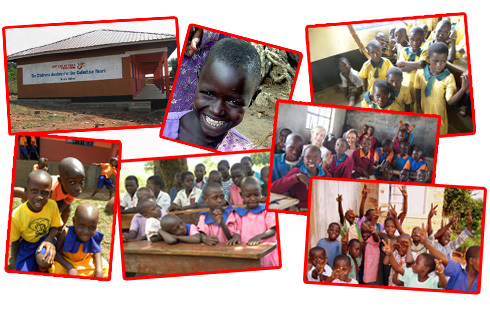 Just $100 helps provide a Ugandan student with his or her own desk, school supplies, and textbooks for the entire year? Support our efforts by making a tax deductible gift NOW. ©2014 The Collective Heart. All rights Reserved. Policy Information.